For any creator, the blank page can be agonizing. When we have nothing in front of us but a blindingly white document and a blinking vertical line, the uncertainty is liable to leave us paralyzed. As such, a good template can be extremely handy. Now, we should all recognize the inherent dangers of templates, which — like best practices and standard operating procedures — can encourage conformity and sameness. But they are not always the enemies of creativity. In fact, templates can actually help unleash our full creativity. As Stanford professor Bob Sutton has pointed out, “Research on creativity and constraint demonstrates that, when options are limited, people generate more, rather than less, varied solutions — apparently because their attention is less scattered.” By this reasoning, an open-ended template that provides pre-set structure and organization can hone our focus and set us in the right direction. It allows us to overcome the dreaded “blank page syndrome” that leaves us spinning our wheels at the starting gate. Back in 2011, we aimed to provide such a tool with our Killer Web Copy Template, which has become one of our most popular free resources for content managers at DivvyHQ. Now, we’ve refreshed and updated this asset to ensure it aligns with what works in the 2019 digital environment. The specific variables will change based on your brand, your website layout, and your objectives. But a few staples of creating impactful web copy — preparation, substance, search optimization — are virtually universal. Those are the aspects we sought to cover in our template, so you can be confident you’re not missing any of the details. Preparation: Before you sit down to write, you can establish some momentum by strategically thinking through a few questions. Shedding light on these underlying factors will help illuminate your path forward. Our pre-writing considerations include: setting a goal, laddering up to broader topic clusters, understanding the intended audience, and selecting keywords or phrases. Content Structure: Everyone consumes content differently. But by and large, a few things are constant: people want scannable, digestible copy that gets to the point quickly. Based on eye-tracking studies and other research, we know that users often follow an F-shaped pattern as they peruse a new webpage. We built our template’s recommended layout to reflect these insights, with keyword-friendly headers (helpful for UX in addition to SEO), visual context, and rapidly accessible key information. Postgame Follow-up: You don’t want to push that content live until you’re certain that it includes everything necessary for optimal performance. So our template also includes a post-writing checklist that you can review and complete before publishing. Ultimately, the success of your web content will be dictated by your team and its creative output. But when you have a solid and repeatable foundation upon which to build, you can maximize the impact of that creativity while developing a sustainable system for producing the work efficiently without sacrificing excellence. At DivvyHQ, we’re all about these types of simple efficiencies that streamline operations for a content team. 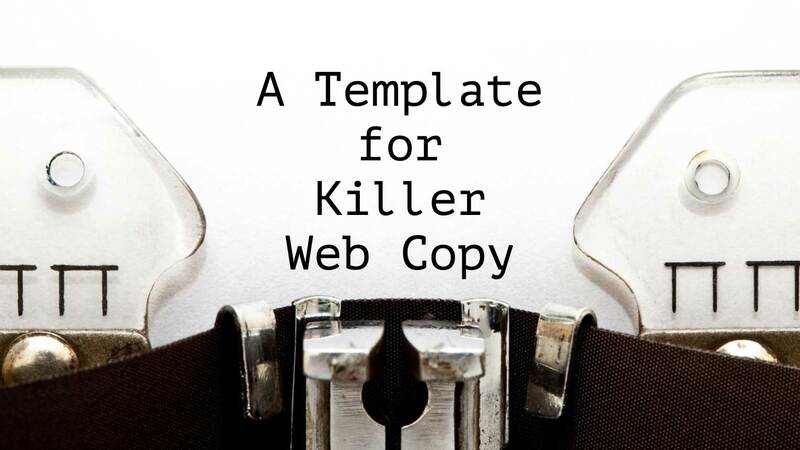 If that sounds helpful to you, go ahead and grab our Killer Web Copy Template (enter your email above). As a bonus, we also invite you to also download our comprehensive Blog Content Template, which similarly helps you skip past the blank page and dive right into creating a post that’s primed for results. We hope you enjoy these resources. If you’re looking for additional guidance on managing your content program and doing more with less, swing by our blog where we offer up tips, updates and expert insights on a regular basis. Then all that’s left is figuring out what you’re going to eat. We can’t help you there, unfortunately.